In the last blog, I offered young Maren the wisdom I wish had been exposed to as I graduated from university all those years ago. 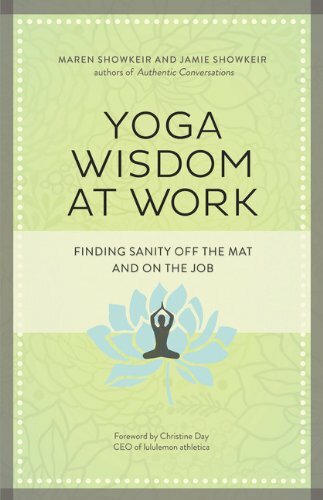 My career journey began with vague intentions and no map — I wish I’d known about yoga’s ancient wisdom to help me illuminate the path. We have covered the First Limb of Yoga, which offers a guide to universal morality. This offering is based on the Second Limb, the niyamas, which provides a guide to personal conduct. Purity (saucha): This precept can be practiced in all kinds of ways: physically, mentally, spiritually and environmentally. I’m suggesting you start with your body, because I happen to know that when you’re the Old Maren, you’re going to wish that you had. Eat pure, healthy whole foods, and keep moderation at the forefront when it comes to things like alcohol and sugar. Seeing your body like the temple it is and taking care of it accordingly will give you daily energy, mental acuity and long-term well-being. Contentment (santosha): The sooner you recognize contentment is completely a matter of choice, the more established and resilient your equanimity will be. Circumstances will never be something you can control, but the way you choose to face them? That’s all on you. Aim high and put your best efforts into everything you do and then — here is the really tricky part — learn to let go of your attachment to an outcome. Attachment will derail contentment lickety-split. Discipline (tapas): Change is hard, and learning can cause discomfort— like the friction caused by two sticks rubbing together. Tapas literally means heat — like the fire you get if you persist with the friction. Discover quickly the importance of delayed gratification, and recognize the rewards of being in it for the long haul. Embracing change— even if it means hanging with pain a bit — fosters personal growth. When you find yourself asking “How will I go through this?” consider rephrasing the question: “How will I grow through this?" Self-Study (svadhyaya): It’s difficult to develop self-awareness unless you make a commitment to occasionally stepping off life’s treadmill. Create regular opportunities to reflect and turn inward. (Begin a regular meditation practice right now!) You can’t fully develop your potential without awareness — of your faulty assumptions, of your contributions to difficult situations, of the habits that aren’t serving you. Surround yourself with smart, kind, giving people. Ask for their feedback and help — and then accept it. Surrender (ishvara-pranidhana): As you enter the world of work, you’ll encounter many people who consider this word synonymous with defeat. Be willing to look at it in a different light. Learn to surrender your ego to benefit the good of the whole. Setting ego aside will set the stage for uniting with your higher, better self and generate clarity, compassion for others and freedom. In our competitive world, this one is hard to practice, but it’s so worth the effort.